You are here: Home / Speed Boats / Cranchi Ellipse 21, 2001 Italian Speed Boat. Cranchi Ellipse 21, 2001 Italian Speed Boat. 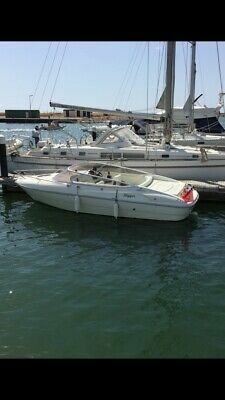 2001 Cranchi Ellipse 21 Speed boat with day cuddy. THIS ITEM IS IN SPAIN. Volvo Penta V6 4.3 GXI motor with DPS – A drive with twin props. 30 metres of new stainless steel anchor chain and new stainless steel anchor. Radio and CD player, USB charge point for phone and ipad, 12v power take off i.e. cooler box, magnetic compass, ski mirror, fish finder/depth reader, fold away bathing ladder, and weather cover. Trailer included but trailer will need some attention by new owner before any great distances undertaken. The boat has had very little use over the last three seasons, but serviced after each use. Currently in dry storage. Any viewings welcome. £12000.00 o.n.o. or the equivalent in euros. ONCE AGAIN THIS ITEM IS IN SPAIN. ONE HOUR AND FORTY MINUTES SOUTH OF BARCELONA. Should you require any more information please do not hesitate to call me ED on+447967351884. THIS ITEM IS ADVERTISE ELSEWHERE AND MAYBE REMOVED AT ANY TIME. Thanks For Looking. Ed. This Cranchi Ellipse 21, 2001 Italian Speed Boat. boat is located in Maidstone, ME17 3JA and is being sold on eBay by eddie4407.